The TIE-DYE system uses heat shock-driven FLP recombinase to excise transcriptional stop cassettes stochastically from three constructs to generate clones expressing single markers or combinations of markers. Any additional UAS constructs will be expressed in RFP-marked clones. The method was described in Worley et al., (2013). 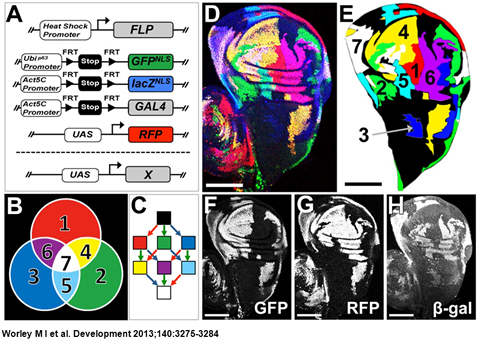 TIE-DYE: a combinatorial marking system to visualize and genetically manipulate clones during development in Drosophila melanogaster.